The Ministry of Health, the Democratic Republic of the Congo (DRC) has confirmed 4 new ebolavirus cases in a new location. Earlier there had been reports of 26 cases of fever, diarrhoea, vomiting, nasal bleeding and death since May. There have been at least 20 deaths attributed to the outbreak thus far. Lab results now confirm this as the second geographically discrete ebolavirus outbreak in 2018 for the DRC. Which member of the genus Ebolavirus? No details are available on the specific species of ebolavirus so it remains unclear if the Ebola virus vaccine (the one specifically designed to protect from disease due to members of the species Zaire ebolavirus) is useful. If it is, hopefully, it will be deployed more quickly than in the last outbreak. The Government of the Democratic Republic of the Congo #DRC 🇨🇩 announced today that preliminary lab results indicate a cluster of #Ebola cases in North Kivu province, some 2500 km from Equateur province. 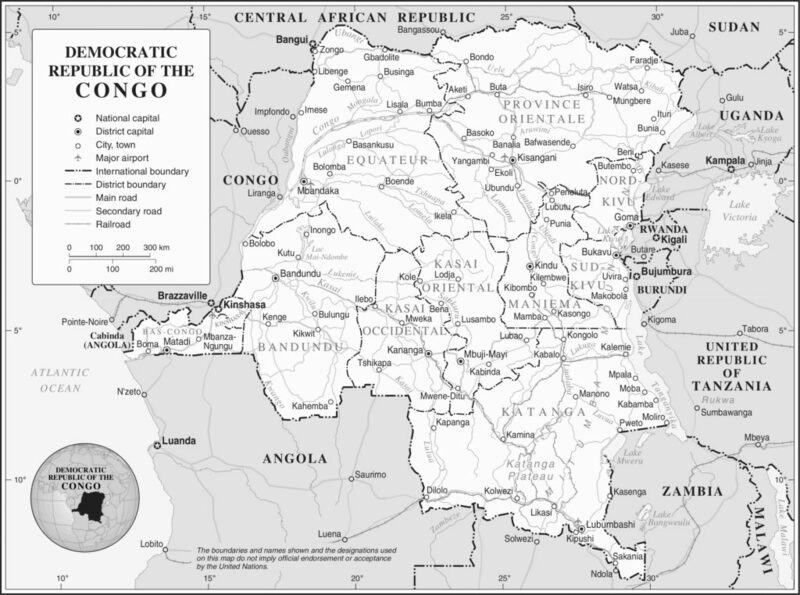 Map of the DRC from Congo Initiative. The suggestion so far is that the outbreak has occurred in the Province of North Kivu in a place called Mangina in the eastern Mabalako health zone, about 30 kilometers (18 miles) west of Beni, a city of more than 230,000 people and that it is a distinct outbreak from the one that occurred about 1,800km (from the city of Mbandaka to that of Butembo according to Google Maps) to the west earlier this year. More details will emerge as experts arrive and communication ramps up. Contact tracing of the earliest cases may reveal any travel history from Equateur province. Genetic details from newly sequenced ebolavirus strains might find informative differences or similarities to viruses from the Equateur Province outbreak. Pinpointing Mangina in the DRC. Map snipped from GeoHack. 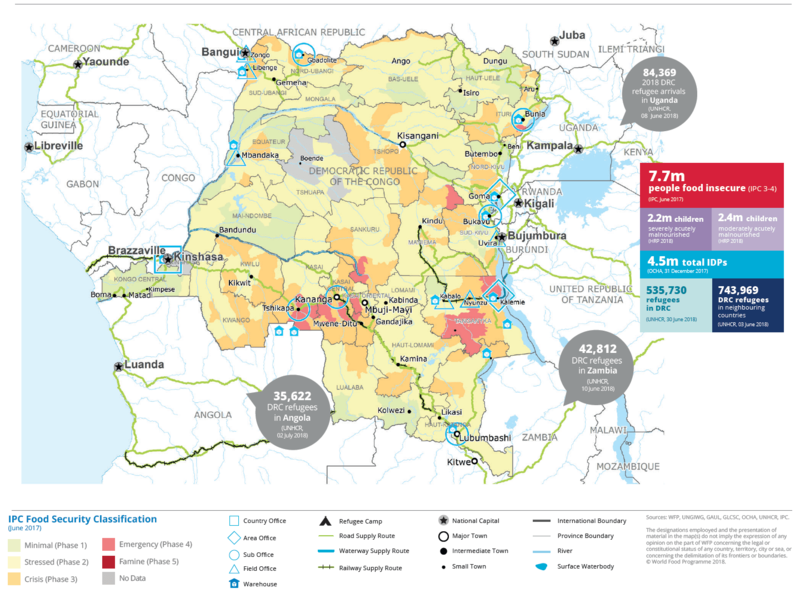 The African Great Lakes region of the DRC is suffering from conflict, including thousands of cases of sexual violence. Also food insecurity among 9.5 million people, 4.7 million internally displaced people and 2.7 million refugees. The Province borders and actively trades with Uganda and Rwanda, with waterways in abundance. Mangina seems removed from the waterways but we armchair observers await better maps to understand the layout. 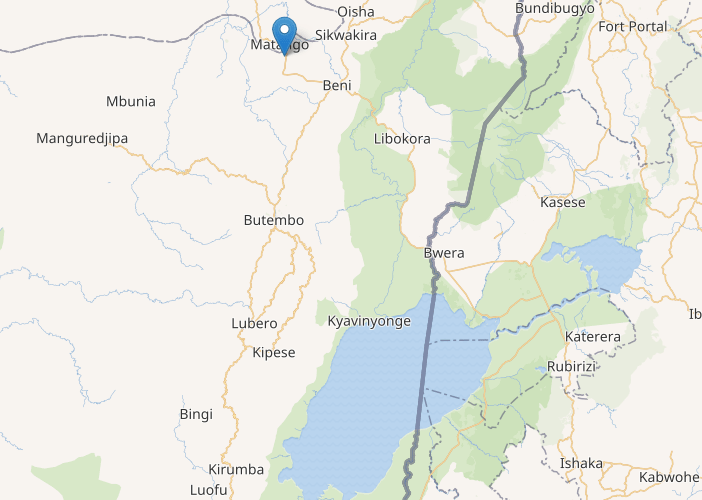 It is interesting to see on the map to the left, that the town of Bundibugyo in the self-named district of Uganda, is not too far off. An ebolavirus species, Bundibugyo ebolavirus, was named after Bundibugyo virus (BDBV) isolated from outbreak cases in this region in 2007. This region will bring a raft of new challenges to the containment of ebolavirus outbreak. Despite high levels of vigilance for Ebola virus disease in Equateur Province, a new outbreak may have percolated for 2 to 3 months. This outbreak has occurred in a relatively remote, under-resourced region suffering conflict. This outbreak exemplifies how difficult it is to quickly identify emerging virus outbreaks in locations like this.